Organized Home | Clean House, Cut Clutter, Get Organized at Home! Clean house, cut clutter and get organized at home with articles, tips and printable planner pages. Printers ready? 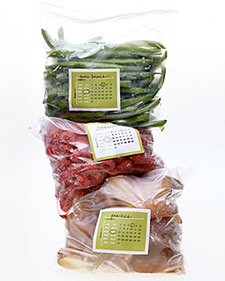 Here's a super resource for freezer cooking: printable labels for frozen foods. They've got that Martha style, but come with a super innovation: an embedded calendar to make it easy to mark the "frozen on" date. Martha advises using a full-page label paper to create stick-on labels, but it's simpler and cheaper to print on inkjet paper and slide the label between double freezer bags. Need inspiration for your notebook? Check out this pretty and personalized household notebook from blogger Such Treasures. How do working mothers manage menus and meal planning? Working mom Leslie Kaufman's story (published in no less than the venerable New York Times) shares valuable strategies for feeding the family fast--and well. I have four core dishes: meatloaf, pot roast, roast chicken and meatballs. I prepare the most basic, pared-down version of each dish. By now it is reflexive. I could do it in my sleep. Perhaps I have. My basic roast chicken is covered in oil and sprinkled with kosher salt and paprika, and that’s that. Every week I make at least one of those dishes and leave it in the back of the fridge to do emergency duty, as in: “I am not eating anything stuffed with spinach. That’s disgusting.” And like a great friend, it never fails me in a crisis. It can be reheated as a meal, sliced for sandwiches, diced for a pasta sauce and used with cheese to fill a tortilla or a twice-baked potato. Real Simple describes setting up Systems for Managing Your Mail that will conquer a huge source of clutter and leave you free to enjoy the Spring and Summer days that are quickly approaching! For each type of incoming mail, RealSimple offers ideas and examples of creating systems and streamlining the process. Jeffrey Yago, of Backwoods Home Magazine, walks you through a list of supplies you will want to keep in your trunk in the event that you are stranded in your vehicle. All items pack up nicely in a small cooler. Bonus? It makes a great emergency kit to grab during severe weather warnings, or in the need to evacuate.